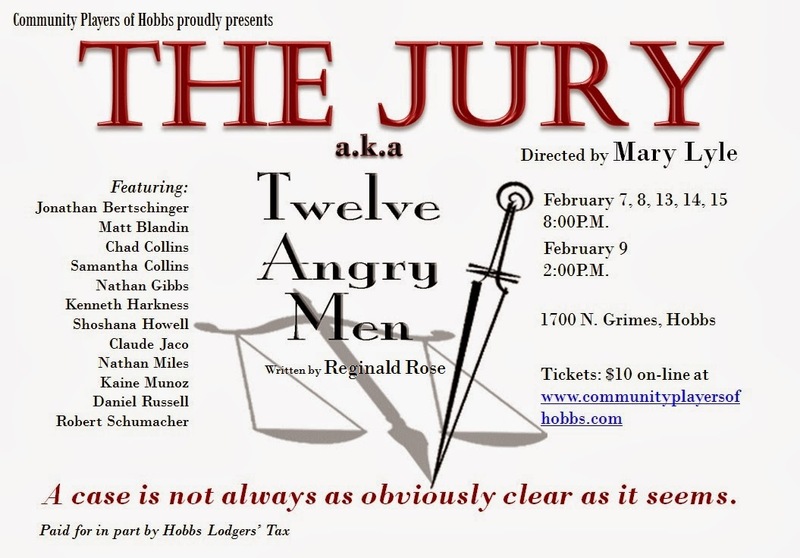 Opening in one week..."The Jury (12 Angry Men)"
Opening on Friday, February 7th, at 8 PM..."The Jury (aka 12 Angry Men)", a stage adaptation of the 1956 teleplay and 1957 movie "12 Angry Men". This intense drama depicts the jury deliberation of a capital murder case in 1962. Twelve jurors must unanimously decide the defendant's guilt or innocence. Locked in the hot jury room, tempers flare, nerves fray, and one by one the jurors confront their preconceptions and prejudices. "The Jury" stars Chad Collins (Jury Foreman), Claude Jaco (Juror 2), Robert Schumacher (Juror 3), Kenneth Harkness (Juror 4), Nathan Miles (Juror 5), Nathan Gibbs (Juror 6), Jonathan Bertschinger (Juror 7), Daniel Russell (Juror 8), Samantha Collins (Juror 9), Matt Blandin (Juror 10), Shoshana Howell (Juror 11), and Kaine Munoz (Juror 12), with special guest star Brad Jett as the Guard. "The Jury" is directed by Mary Lyle, with assistant director Monica Russell. Tickets can be purchased online (click the ticket link to the left of our site), or at the door. Don't miss this compelling drama! Show dates are February 7, 8, 13, 14, 15 (8 PM) and February 9 (2 PM). First rehearsal is Friday at 7 pm at the Playhouse. The Gala was a wonderful event, and many Playhouse folks were recognized for their contributions to the Community Players of Hobbs. Audition notice "Dixie Swim Club"
Five Southern women, whose friendships began many years ago on their college swim team, set aside a long weekend every August to recharge those relationships. Free from husbands, kids and jobs, they meet at the same beach cottage on North Carolina's Outer Banks to catch up, laugh and meddle in each other's lives. Auditions for "The Dixie Swim Club" will be held on Saturday, January 25th (7 PM) and Sunday, January 26th (7 PM) at the Playhouse. "The Dixie Swim Club" will be directed by Robert Schumacher ("The Yard Sale"). Show dates are March 14, 15, 16, 20, 21, 22. Casting is for five women. "The Dixie Swim Club" is a hilarious and touching comedy from the authors of "Hallelujah Girls". Bearing many of the hallmarks of "Steel Magnolias", this raucous comedy is built on the strength and humor of five strong Southern ladies. 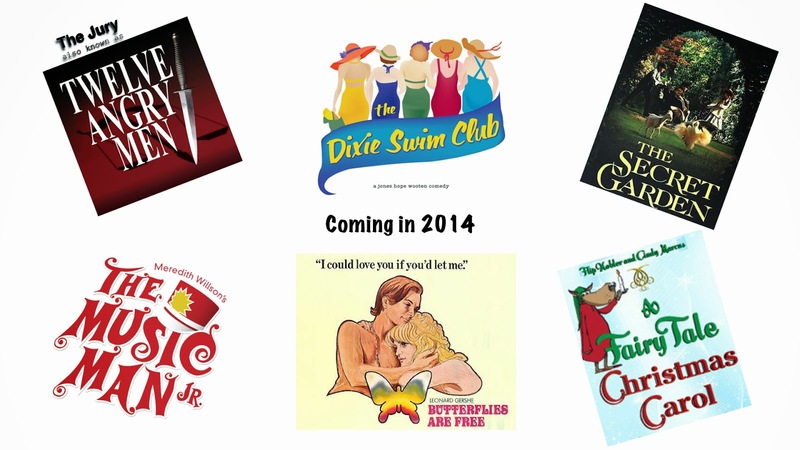 So, ladies, put on your best Southern accent and come audition for "The Dixie Swim Club"! Sheree Hollinger – The perennial team captain, practical, supportive, and a fount of boundless energy. Never without her “to do” lists or Pocket Scheduler, her tendency to be hyper-organized occasionally drives her friends a bit crazy. She's the eternal tomboy, a health nut and an all-American mom who lives in Raleigh, North Carolina, with her family. Dinah Grayson – The wise-cracking cynic of the group, who has fought her way to the top and relishes the view. A lawyer in the biggest and most prestigious law firm in Atlanta, she excels at everything . . . except romance. Armed with a dry martini and an even drier sense of humor, she seldom reveals her softer side as she tackles life head-on. Lexie Richards - A true Southern belle who lives in Chapel Hill, North Carolina. She is the vain, youth-obsessed event planner for a chain of four-star hotels that has never shied away from the occasional nip or tuck (she keeps her cosmetic surgeon on speed dial). Always one to revel in her status as a man-magnet, she can be counted on to share wild and hilarious tales of her romantic exploits. Jeri Neal McFeeley - The ditzy ray of sunshine of the group. She's perky and naive and always sees the positive side of everything. Having been a nun for many years, she has been protected from life's seamier side. Even though she appears to be predictable on the surface, she recently relocated to Charlottesville, Virginia, and continues to make life choices that surprise and amaze her friends. Vernadette Simms – A hard luck case if there ever was one. Marriage and motherhood came shortly after college and a dark cloud has hovered above her ever since. A public school teacher with limited finances and a problematic home life in Spivey's Corner, North Carolina, she is self-deprecating by necessity. 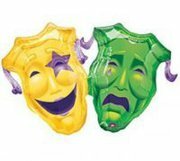 She faces her tribulations with gallows humor and the unwavering support of her lifelong friends. Tickets are on sale for "The Jury (12 Angry Men)"
Tickets are now on sale for "The Jury (12 Angry Men)! Show dates are February 7, 8, 9, 13, 14, 15. Click the ticket link on the left side of our website (www.communityplayersofhobbs.com) to get your tickets for this gripping drama! Oh my, what a full year we have had at the playhouse. Seven great shows and a haunted house makes for non stop entertainment! All of the new talents and so many, many of the returning talents created a season of which to be proud! 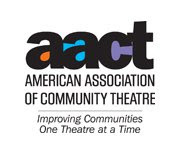 I am looking forward to another grand year and hope to see all the seasoned actors, actresses and even more new gifted entertainers and workers in 2014. Nothing can be done without all the action on the scenes and behind the scenes. And don't forget the 2014 Gala held at the Western Heritage Museum on January 11, 2014 at 7:00 p.m. A lovely way to say thanks to many who have been instrumental in making this a successful year. You will also be able to be a part of electing new officers for the coming year. Hope to see everyone thereand thank you for supporting the arts!